NCI can supply you with a wide variety of cleanroom mats. From anti-fatigue mats to cleanroom sticky mats, we have what you need. 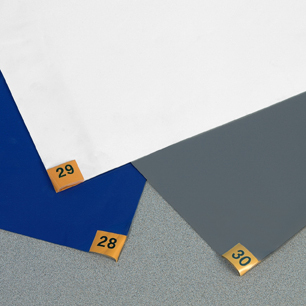 Our cleanroom sticky mats are available as permanent, washable mats or as peel-off mats with sequentially numbered tabs. Do you need a whole cleanroom floor done in sticky mats? Then our washable mats will do the trick for you. If not, our peel-off tacky mats come in a variety of sizes and colors and can even be customized with your name or logo. Our comfortable anti-fatigue cleanroom mats come solid or perforated, anti-microbial, and ESD. What Are Sticky Mat Frames? A sticky mat frame is generally used in environments where you need to easily move the mat for cleaning and/or to prevent the adhesive backing from leaving any residual adhesive on the floor. Another instance where a tacky mat frame is used is in carpeted areas or other surfaces where the adhesive backing cannot properly adhere to the flooring. Our sticky mat frames come in aluminum for that ultra professional look.